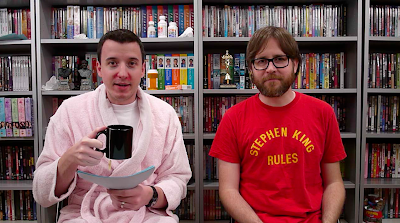 Patrick and Doug share the movies they watch when they're home sick. Another fun episode guys and some good sick picks. For some reason being home sick is when I'm most in the mood for older movies - probably because (I'm guessing) the modern feeling of sickness is how people in the OLDEN DAYS just always felt. So yeah, like one of my last sick day movies was Ben Hur - next time I can see myself finally getting around to Lawrence of Arabia - that kinda stuff. I guess I don't look for the movie itself to make me feel better - that's what Nyquil and heroine are for! In all seriousness though I would say Back to the Future, Original Star Wars Trilogy and Shawshank Redemption, nothing like the soothing sounds of Morgan Freeman narrating things, its chicken soup for the ears. This was great. Someday I'll have to check out this "Ferris Bueller's Day Off" of which you speak. It sounds like a wonderful little movie. When I get sick enough to stay home, I usually have a high fever and gulp industrial amounts of cough syrup. On days like that, Koyaanisqatsi seems to have a narrative, so I watch that. I rarely watch epics, or any kind of series, because I tend to fall asleep and then wake up a lot when I'm sick. So I keep to things I've seen a million times and/or it doesn't matter if you check out for 20 minutes at a time. This is one of the reasons I've spent money on those 100 Greatest (public domain) Horror/Sci-Fi Movies of All Time disc sets you can get for like $20. Because when else should you watch Dementia 13 than drunk, feverish, and passed out for 10 minutes at a time? I swear, I've seen that movie 6 times and I have no idea what it's about. I watched BRAZIL really late at night when I was feverish. Good idea, or best idea? HP/Goblet of Fire - I actually went to a boarding school for the second half of high school, and had a wonderful time. This flick, the first HP directed by a Brit (and it shows), most reminds me of those magical years. Pride and Prejudice ('05) - Knightley and Macfayden are just fantastic together. Hot Rod - Do movies get any more fun than this? Also, Isla Fisher is so hot you'll probably pass out, which only helps with getting over the whole sickness thing. Alternate selection/for Day Two: Fired Up! Muppet Treasure Island - Pirates, Muppets, immortal songs. Verdad. Once Upon a Time in Mexico - Yes, this movie is pure awesomeness. No, that's not up for debate. Ooh, The Sure Thing, awesome pick. Definitely worth an honorable mention at least, or it could go in the Hot Rod slot. Also, Your Highness could easily go in the OUaTiM one. I really like the HP and Hot Rod (and Fired Up!) selections. Added to the ol' sick rotation. Doug's ongoing dislike of The Dark Crystal is the great tragedy of the human spirit. My go-to sick time movies are usually Fletch, Ghostbusters, Real Genius, and/or A Nightmare On Elm Street 4: The Dream Master. It never occurred to me until now that they're all 80s movies, and that probably means I require a great deal of therapy to figure out why I head back to childhood whenever I'm sick. 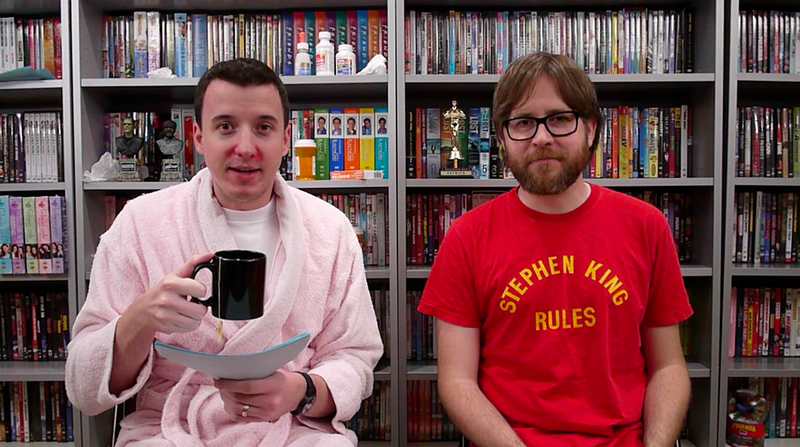 Also, this is the first episode in which I haven't had to covet Patrick's shirt, because I already have that one! Looks better on him, though.